Day before the national mourning day held, authorities released 20 names of the victim. There were 43 victims. The first batch is sent from Amsterdam today expected to arrive tomorrow morning. 2. Traffic will be put on hold for some landmark areas. There are Sultan Abdul Samad building at Kuala Lumpur, Kuala Lumpur International Airport, KLIA 2, Penang bridge, Sultain Iskandar Customs, Immigration and Quarantine (CIQ) Complex, Johor Baru. Do not attempt to park cars nearby KLIA or KLIA2 as it potentially disrupting traffic flow. Sabah and Sarawak destination are Sabah nearby Hyatt Hotel, Kota Kinabalu. As for Sarawak, Pasar satu. It is a long-haul journey. Expected to be arrive 10.00AM - 11.00AM. The location is Bunga Raya Complex. Malaysian Armed Force will perform first honor ceremony for civilians. 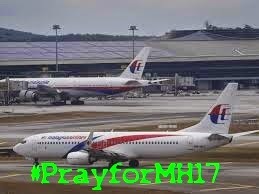 A moment of silence will be taken place for 2 minutes preventing any aircraft using the airspace. Reminder for everyone to wear black color wear refrain from wearing any colorful wears. Imagine the dress code in those western hollywood movie when they have a funeral ceremony. Before the announcement of national mourning day, KFC, Pizza Hut, McDonald at the earliest has uploaded cover to their Facebook page as a sign of commemorate MH17 victims. KFC and Pizza Hut owned by same management decided to halt any advertisements. Prime Minister Department announced to held simultaneously for the purpose of receiving before laid to rest. The funeral prayer in local language " Solat Jenazah Ghaib " . Live broadcast is available nationwide focusing on MH17 victims ceremony. some of the channel will be replaced with the recitation of the Quran as well as religious program. The confirmed TV network to broadcast live on Bunga Raya moment of silence is RTM channels such as TV1, TV2, TV3 and TVi. Besides, you could tune to radio station of NasionalFM, TRAXXfm, Ai Fm and MINNALfm. Maxis, Malaysian employer federation, Scomi Bhd, Mahkota Medical Centre, Malayan Banking Sdn, Pantai Hospital Klang are few company names joining together for a moment of silence. The list is full there are more than these company taking part in their own ways. Yang Di-Pertuan Agong Tuanku Mu'adzam Shah are attending ceremony at KLIA while Sultan of Perak Sultan Nazrin Shah are expected to be in Ipoh. As expected, the flag will be flown half-mast nationwide.